To avoid the frustration of hours of work disappearing into thin air, WordPress backup plugins are the best solution to safely and securely store progress in the case of an emergency. But with the abundance of plugins accessible to users – and each one clamoring for users by inevitably claiming to be the No. 1 choice – deciding on the appropriate resource is not a straightforward decision. We’ve compiled and compared four often-discussed plugin options, both paid and free versions included, to see how they stack up against each other. If you’re one to value peer reviews, UpdraftPlus will impress skeptics with a 98% positive rating based on its overall reviews in the WordPress plugin directory, over 2,000 of which responded with a solid 5/5 stars. As far as current users go, the site boasts active installs reaching upwards of 800,000. The overwhelming praise UpdraftPlus experiences stems from it being much more involved than a simple backup plugin. At its core, the free version of the plugin serves its purpose well by offering the separate backups of either individual WordPress files or the entire database. The backups can be stored through a variety of outlets such as Dropbox, Google Drive, Amazon S3 and Rackspace. Outside of third party options, backups can also be sent via email or FTP. If these free options don’t satisfy your storage needs, the Premium version expands the alternatives to include WebDAV, Microsoft OneDrive, Google Cloud, Microsoft Azure and an encrypted FTP. Regardless of where you stash your sites’ backups, they can be managed and configured remotely through UpdraftCentral, a dashboard service from the minds of UpdraftPlus. For a more hands-free experience, backups can be scheduled to occur every 4, 8 or 12 hours, weekly, fortnightly or monthly. If the scheduled procedure fails at any point or stalls for any reason, the backup will be retried automatically, a welcome measure to prevent malfunctions and flukes. A report containing the details of the errors can also be sent via email to give a heads-up in case hands-on action needs to be taken. But the most impactful features of UpdraftPlus are saved for the UpdraftPlus Premium version, which is very affordable when compared to other backup alternatives. The service reaches a wide array of consumers with flexible pricing options: The service can be implemented on two sites for $70; 10 sites for $95; or an unlimited number of sites for $145, all of which are good for a year of support and updates. With the purchase of the Premium version, users will find their options expand dramatically. For starters, it unlocks access to 1Gb of storage on UpdraftVault, a service that allows yet another third party location to store backups. The prospect of more storage may not seem as appealing if you already own space somewhere such as Dropbox, but the paid version also allows for storing backups in multiple strongboxes. The ability to migrate and clone websites with the paid version is what sets this service apart as more than just a backup generator. Building WordPress sites take hours at times, and the cloning process allows for a glorified copy/paste to other locations, a typically time-consuming process turned easy. An apparent downside with UpdraftPlus lies in the support function; FAQs are available on the home site’s support page, but network and personal support will cost you. As some consumers have indicated, the user interface is somewhat clunky and may require some previous know-how, but it shouldn’t take long to learn the ropes. Learn More about UpDraft Plus Premium. 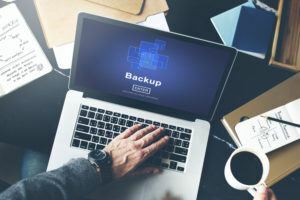 To avoid any delays in deciding on a backup plugin, if you’re just beginning with your site and find yourself looking for a free service, BackupBuddy may be better revisited at a later time. However, if an $80 starting price for convenience seems like a fair tradeoff, then BackupBuddy seems appealing. It’s been around since 2005, just two years after WordPress came about, so it’s gathered quite a following. The beginner-friendly plugin welcomes newbies with a clean, simple layout that’s almost impossible to become lost in, a design shared by the interesting and engaging website. Like most backup alternatives, this paid plugin offers the ability to schedule backups for constant protection. It offers quite an extensive selection of schedules too; with 11 different options, you can schedule updates ranging from on the hour to once a week to once a year. The plugin will provide continued updates for one year, so the latter schedule may seem wasteful given the higher price. Separate backups can be created for the database, just files or the entire site, or custom-made profiles can tailor to specific needs. These backups can be stored remotely in a variety of locations including their BackupBuddy Stash service, Amazon S3, Google Drive, Dropbox and several other popular choices as well as the option to download an entire WordPress site as a zip file. When it comes to importing backups back into your sites, BackupBuddy uses a partner program known as ImportBuddy. The separation of these programs isn’t ideal, but at least the importing counterpart is free with the purchase of its backup brother. Beyond these essential functions, some of the more desirable features are locked behind the exclusive-looking Developer package. Migrating serialized data, updating text throughout your database and running scheduled CRON jobs are some aspects of the Developer option, but these might not be much interest to the fledgling WordPress sites BackupBuddy often appeals to. The ability to migrate and clone entire WordPress sites may be a redeeming quality, but perhaps not enough to compete with competitors’ prices. Aside from the aforementioned starting price of $80 for one site plus a bonus site that be used when moving domains or for an entirely separate site, BackupBuddy offers three other options: The Freelancer package that supports 10 sites for $100 a year; the Developer package that supports unlimited sites for $150 a year; and the Gold package that supports unlimited sites for $297. The Gold package grants the benefits of BackupBuddy for life with continued updates and Stash storage access, so if you’re in WordPress for the long run, the Gold BackupBuddy may be worth the hefty price. BackWPup is another viable alternative to fulfill your backup needs, though it doesn’t get quite as much attention due to a few pitfalls by the developers. For starters, the service’s product site is somewhat misleading, as it only displays the functions of BackWPup Pro, the paid version of the product. There’s no mention of the free version, which you’d have to find on the WordPress Plugin Directory. There’s nothing wrong with advertising the paid version, but it’s not a positive start if that’s the first place you look. As far as the free version goes, the service matches several others regarding functionality. Scheduled backups are a must, and while BackWPup satisfies the requirement, it does so with fewer options than its competition. The only available options are daily, weekly or monthly, something that may seem inadequate to those who have been spoiled by the likes up BackupBuddy. When running backups, database or file options come as standard, and they can be downloaded to the usual crop of cloud services, FTP servers or emailed directly to users. The plugin lacks its own storage space, unlike BackupBuddy’s Stash or UpdraftsPlus’ UpdraftVault, but with the myriad of alternatives out there, the absence shouldn’t be a deal breaker. But while it’s not much inconvenience to be without a cooperative storage option, one of the most puzzling aspects of the free version is the exclusion of Google Drive as a potential storage location. With the popularity and simplicity Google Drive offers, it seems like a no-brainer to make it a standard option for stashing away backups. Unfortunately, this function is only obtainable through the Pro version, something that just might qualify as a deal breaker. If the absence of storage options weren’t dissuading enough, neither the paid nor free version offer a native, in-plugin method to restore the scheduled backups. There’s currently a beta version of the function available by emailing the developers for access, and restorations can be applied manually with a zip file and some instructions, but the lack of the feature is odd when stacking BackWPup against its free peers. Other features of the paid version include a helpful job wizard for easy navigation, premium product support, and automatic updates, meaning the free version will require manual updates. The paid version offers several pricing options: One site for $69; five sites for $89; 10 sites for $189; and 100 sites for $349, all of which come with updates and support for a year as well as a lower renewal price. There are worse options out there, but given the comparative lack of functionality, BackWPup certainly isn’t leading the pack. Out of the previously examined plugins, VaultPress is best stacked up against BackupBuddy in terms of functionality and convenience. Reason being, similar to BackupBuddy, there’s no free version, only a paid product that offers a similar level of convenience and hands-off usability. For starters, VaultPress is made by Automattic, the makers of WordPress, so it’s bound to play nice with the WordPress environment. Instead of asking users to schedule backups, daily backups are run on even the most basic pricing levels. Up to 30 days of these backups will be kept preserved, but additional space can be purchased if need be. The storage situation raises the question of where the files will be saved, something that’s not easily answerable when searching through their home page. While other plugins offer their own storage solutions, VaultPress requires it. The backups are stored within the secure data centers of VaultPress. While there’s no native option in the plugin to move them to third party destinations such as Google Drive, they can always be downloaded to your computer via the VaultPress dashboard. And the dashboard is another element sure to entice users; it’s easily navigable, sleek and attractive, and the options and actions are clearly explained. An upside to it being a paid-only product is the pricing options offer several features not found in other plugins that may be appealing to the targeted clientele. VaultPress offers four packages that boil down to whether the user wants those extra features or prefers to stick to only backing up and restoring files. For the welcomed additions of daily malware scanning, easy site migration, and spam protection, the Basic package is $99 a year or $9 a month while the Premium package is $299 a year or $29 a month. Choosing Premium over Basic will net users real-time backups instead of daily ones, unlimited backup archive space, and priority support. For those wishing to forgo the extra content, the Lite option at $55 a year or $5 a month and another Basic option at $165 a year or $15 a month would likely be the better choice. The two simpler options are somewhat hidden on the site, an, unfortunately, sneaky aspect of an otherwise attractive product. The need for a plugin for safety is undeniable, but the decision of which one to pursue ultimately is reduced to each individual’s unique website needs. From those that we examined, there do seem to be some clear leaders in the field. As a free option, UpdraftPlus proves quite compelling with its default features and rave reviews. The variety of third-party storage options is a welcome inclusion, especially when easy solutions like Dropbox are considered. The frequent updates and attention the plugin receives from the developers are appreciated from a consumer standpoint. It has enough to get you by if you’re looking for a free WordPress backup plugin. If you’re still looking to pay for a backup plugin, the UpdraftPlus Premium version seems like the best way to go. The dashboard also makes the process of backing up and restoring files very easy, and the included UpdraftPlus Vault storage service means one less thing to think about when it comes to your backups, a massive advantage for less tech-savvy consumers. And as far as pricing goes, the developer license for unlimited sites only costs $145, which is exceptional value and makes it very affordable to protect all of your WordPress sites.